Formed in 1918 as a Pan-Indian movement and in response to government abuses and relocations, the Native American Church synthesized Christian beliefs with the sacramental use of peyote, a small, spineless cactus that grows primarily in Texas and Mexico. Although using peyote for ceremonial purposes occurred in many tribes prior to the organzation of the Church, the Native American Church is the first, large organized ceremonial establishment to occur across tribal differences. The Church still exists today despite U.S. legal objection to the use of peyote, which is classified as an illegal drug. Services usually take place on weekends, but there is no set schedule. Some groups hold ceremonies monthly while others are more spontaneous. Peyote is psychoactive and so members often have visions, but it is the community experience of these effects that gives the ceremony spiritual power. 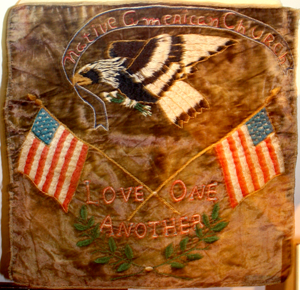 Shawnee Native American Church altar cloth, circa 1940, Oklahoma, collection of the Oklahoma History Center, photograph by Uyvsdi . 2014 Native American Church. The American Mosaic: The American Indian Experience. Http://americanindian2.abc-clio.com/Search/Display/1482221?terms=native+american+church, accessed June 27, 2014.